(Nanowerk News) Quantum dots may be small. But they usually don’t let anyone push them around. Now, however, JQI Fellow Edo Waks and colleagues have devised a self-adjusting remote-control system that can place a dot 6 nanometers long to within 45 nm of any desired location. That’s the equivalent of picking up golf balls around a living room and putting them on a coffee table – automatically, from 100 miles away. Exact placement and control of QDs are fundamental requirements for many of the most exciting developments on the nanoscale (that is, at dimensions approximately the same as molecules), including photonic and electronic systems that are expected to revolutionize data processing and biomedical research. So there is worldwide interest in manipulating QDs, which have useful optical properties like those of individual atoms. 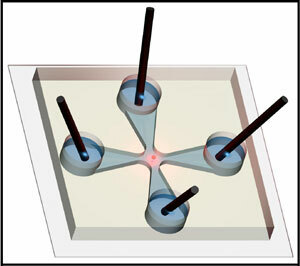 QDs can be moved with “optical tweezers” – a system that sets up a gradient of forces from multiple laser beams – or by electrophoresis, in which a microscopic object with a surface charge can be pushed through a fluid or gel by applying a constant electric field. (Electrophoresis provided an early method of separating DNA for analysis.) To date, however, results from both methods have been insufficiently exact for anticipated applications, and typically move multiple particles at once. Illustration of the microfluidic channel intersection, showing the four fluid reservoirs, each with an electrode in place. The array is carved into a transparent polymer sheet about the thickness of a nickel coin and about 2 cm on each side. But now a research team headed by Waks and Benjamin Shapiro of UMD’s Fischell Department of Bio-Engineering has invented a fully automated apparatus that controls the position of a single QD by manipulating the fluid in which the dots are immersed. The system exploits a phenomenon called electroosmosis, in which liquids with polar molecules such as water are pulled in specific directions by applied electrical fields. The football-shaped dots are very small: 6 nm long by 3 nm wide. If they were laid end to end, it would take about 1500 of them to reach across the diameter of a human hair. They are suspended in a liquid which is a mixture of water and various thickening agents, and thus move with the flow. The liquid fills two microfluidic channels (5 micrometers high by 100 micrometers wide) that intersect at right angles. At the ends of each channel are cylindrical fluid reservoirs, each of which contains a platinum electrode. By altering the voltage between pairs of electrodes, the scientists control the motion of the fluid in two dimensions. To position a dot, the researchers first identify a single QD with a microscope. This is possible because when a dot is struck by a green laser beam (532 nm), it begins to blink, emitting red photons at 655 nm. The blinking light is detected and the individual dot’s motion is tracked by a microscope. When the dot goes “dark,” the tracking pauses until the next blink. When the QD blinks, its position relative to the target location is re-detected. The researchers programmed their device to calculate how much voltage will be required to shove the dot by the right amount in the desired direction. At each blink, an appropriate voltage is applied to the electrodes (see diagram below). The QD thus proceeds to its intended destination by a series of nudges. Once there, the system can keep it in place for more than an hour. One potential problem the group faced is that the dots not only move in two dimensions, but also rise and fall within the fluid. As a result, the imaging microscope loses its sharp focus and the dot can be lost. The scientists compensated for this effect by programming their microscope to detect the onset of fuzziness in the image and automatically adjust its distance to the dot accordingly. The microfluidic array, including reservoirs and electrodes, is about the size of a postage stamp. It fits easily atop a microscope slide which is placed on a small platform with a circular hole in the middle. The microscope is located beneath the slide, and refocuses using a piezoelectric transducer – a device that allows extremely small displacements of special materials when exposed to electric potential. The microscope image is routed to a digitalcamera that records 20 frames per second. The entire system operates at room temperature and pressure. Reference: “Manipulating Quantum Dots to Nanometer Precision by Control of Flow,” Chad Ropp, Roland Probst, Zachary Cummins, Rakesh Kumar, Andrew. J. Berglund, Srinivasa R. Raghavan, Edo Waks and Benjamin Shapiro, accepted for publication in Nano Letters.